1. A gigantic vertical ruffle down the center front. This would be a darling dressy dress, in a silk with lots of body so it could sustain the shape of the ruffle. 2. A color-blocked version of the dress, with pockets at the side seams. Or if you feel ambitious, use the on-seam pockets from the Book Report Dress to fit right into that color-blocked seam so they don’t show at all! 4. 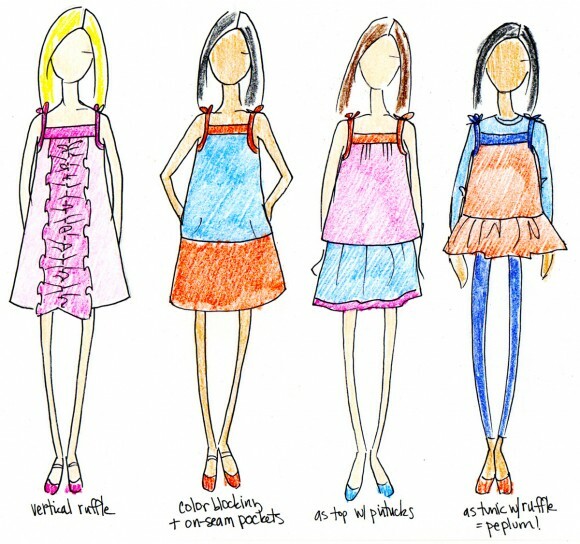 Shorten the dress into a top and add a ruffle, turning it into an adorable tunic to work with leggings. 5. 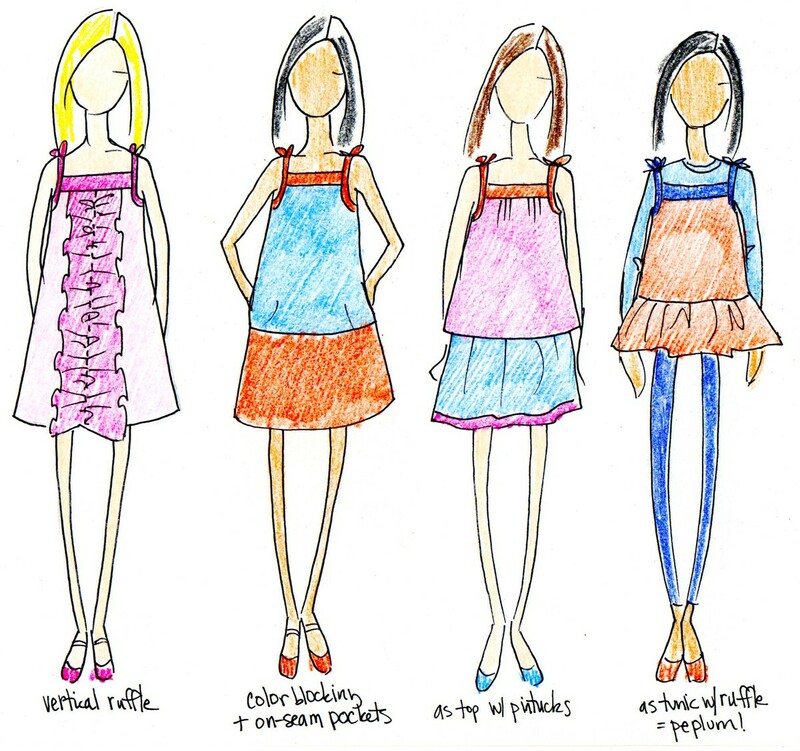 Add little vertical ruffles to the front, and pockets with a similar ruffle at the top. 6. Color-block the dress with a wide racing stripe or vertical stripes down the front and back! 7. Lengthen the dress and add a ruffle to turn it into a dramatic nightgown. 8. Determine the perfect length for the shoulder straps and seam the bias instead of tying it. Color-block the dress, adding a seam down the center front so you can chevron some pieced stripes! 9. Add ribbon details to the yoke and skirt, including little matching ribbon bows. 10. Add a big applique to the dress! I’m excited to see what everyone makes with this pattern. 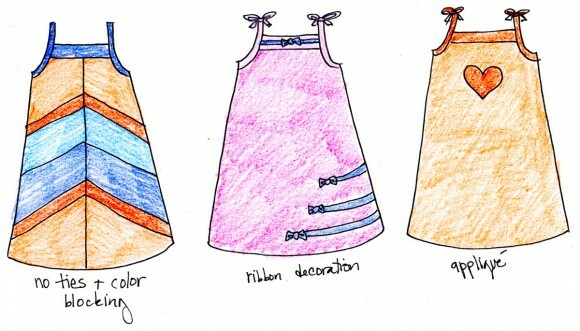 And if you want to add your own dress to the ones that have already been submitted, I think there’s still time! Many of you have sewn multiple versions of this dress to donate to worthy causes, too, so thank you for your contributions! Wow. I just posted my remix on PR&P, and it was color blocked one just like your illustration! Well, it was fun remixing this pattern and I love seeing your ideas! Imagination Pops Over Time with these Popover dress designs. These are lovely and so inspiring! Thanks for sharing. 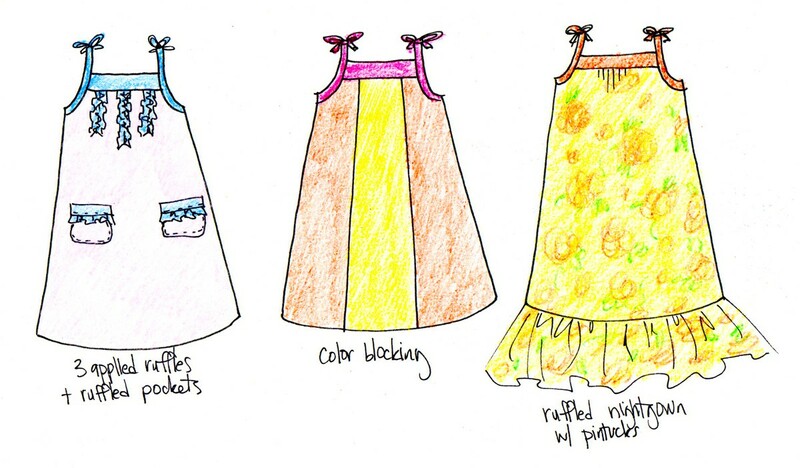 I’d passed this pattern by because my daughter rarely elects to wear dresses. It hadn’t occurred to me to try shorting this to a tunic, but it’s the perfect idea to try for next summer!